Conceptual modeling is the activity of formally describing some aspects of the physical and social world around us for the purposes of understanding and communication. A friend of mine recently shared the latest Bloom Consulting country brand tourist edition report. As background, Bloom Consulting produces four ranking reports of interest to US based economic development professionals – 1) Country Brand ranking trade edition, 2) Country Brand ranking tourism edition, 3) US State Brand ranking trade edition and 4) US State Brand ranking tourism edition. I encourage you to check these reports out, the research is quite good and the results are informative. The latest report is the 2014/15 Country Brand ranking tourism edition. [SPOILER ALERT!!!] The US ranked #1 among the countries studied. In my branding experience, Bloom Consulting is both right and wrong in their point-of-view. Although I can see how their position can dramatically increase their portfolio of projects since economic development is a fragmented profession and many organizations (potential Bloom Consulting clients) are only focused on one of the six objectives (e.g. CVB organizations are focused on tourism, EDOs are focused on investment, Workforce Development Organizations are focused on Talent, Community Development Organizations are focused on pride, and elected officials are focused on public diplomacy, and State Departments of Development are focused on exports). The Bloom Consulting model is a neatly compartmentalized way to look at a brand through the lens of the target audiences Bloom Consulting seeks to engage as clients. Where I think the model is right is that it recognizes places have specific levers (objectives) that can be tweeked to improve their competitiveness, and these levers should be evaluated to find opportunities for performance improvement. Where I think the model is wrong is in viewing the levers independently. In reality, the levers are very interdependent and should be strategically approached as such. Perhaps the easiest example to illustrate my perspective is the direct relationship between talent and investment. And while I appreciate that thinking about the levers as interdependent adds a level of complexity to the branding process, it is none-the-less a more realistic perspective. So how do you deal with the complexity of managing a place brand based on a single, overarching promise? First, recognize/internalize that place branding is a strategic approach to better meeting the needs of residents (both current and future). It is a means to an end. And, the ultimate judges of whether you are doing a good job or not are the residents of your place. In the USA, I advocate that the promise of every community, state, or region is to “better enable achievement of the American Dream”. Consider this a category benefit. It signals to everybody involved what your place delivers. For residents it signals what they can expect from their choice to live and work in a particular place. For companies it is what executives can expect from choosing to invest in doing business from a particular place. And for tourists it signals what can be expected from visiting a particular place. 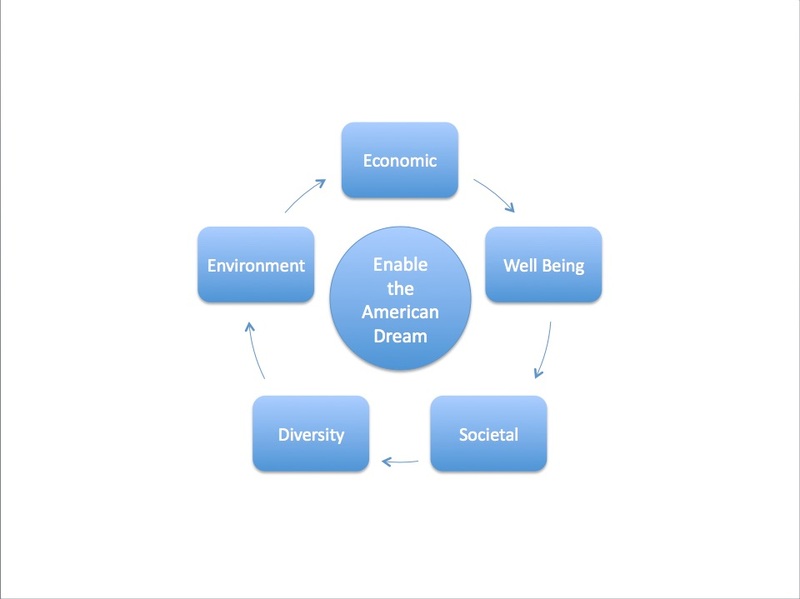 In the American Dream Model, there are five interdependent dimensions you need to strategically manage. It is important to note places cannot “own” the frame of reference. The underlying benefit in a frame of reference is considered a category benefit. All competitors within the frame of reference are expected to deliver the benefit. The differentiation between places is in the degree to which, and the way in which the benefit is delivered. The difference is HOW the American Dream is enabled (i.e. the unique combination of assets, infrastructure and public policies/programs) that differentiates one place from another. To illustrate the point, think about soap for personal care. The category benefit is cleanliness. Ivory differentiates itself from other brands within the category based on providing a degree of purity and mildness. Dove, on the other hand, has differentiated itself based on skin moisturizing. Both deliver the category benefit of cleanliness. In fairness, these two state examples are described retrospectively. The marketers responsible for creating their state brand promise did not proactively use the American Dream Model to guide their brand architecture design. Yet, both states actually got there in the end. First, let’s look at Michigan. The state promises to enable the American Dream (category benefit) by delivering a uniquely “pure” experience. For tourists, the HOW is by providing access to “untouched, untamed and unspoiled” destinations that are in stark contrast to the “overdeveloped, strip-malled, cookie-cutter world” they live in. For businesses the HOW is by providing “natural resources” for success that include public commitment, capability, and culture. For talent the HOW is to provide opportunity. Second, let’s consider Ohio. The state promises to enable the American Dream by reducing negative trade-off decisions. Tourists can have a memorable bonding experience with their family without breaking the bank. Businesses can profitably serve domestic consumers and international markets without compromising their opportunity for expansion. Residents can achieve their personal and professional aspirations without sacrificing one for the other. The promised category benefit is to enable the American Dream. The competitive differentiation versus other states is in the benefit is delivered. It is based on the choices each state has made in managing the economic opportunities, resident well being, societal fairness, diversity friendliness and physical environment that underpins the state’s uniqueness. The HOW is creatively communicated. For Michigan it is stated as a “pure” experience. For Ohio, it is described as the ability to minimize undesirable trade-offs. The HOW is ultimately translated into a specific, relevant and authentic benefit for each communication target audience. I don’t expect the people at Bloom Consulting to agree with my perspective. It would make the task of selling their services more complex. But, as an economic development professional or elected official I do encourage you to establish the overarching promise of your place as better enabling the American dream and to strategically think in terms of the unique collection of assets, infrastructure and public policies/programs that impact the five dimensions of the American Dream. Managing your place brand using the American Dream Model will: 1) help your place better differentiate itself, 2) strategically align all organizations involved in positively impacting the lives of your residents against a singular mission, and will 3) increase the probability of delivering a positive ROI on taxpayer dollars by better ensuring synergy of investments made by those organizations in pursuit of their respective missions.